Featuring boots, casual, dress, and athletic styles in sizes for the entire family. Includes designs for dance and cheering. Get an additional $5 off orders over $100. Get 20% off Winter boots with the family. Get Up to 30% off women’s shoes. Exclusions apply. See site for details. Get an extra 10% off everyday low prices sandals. New spring styles sale! Get up to 30% off MSRP on women’s shoes. These styles range from Casual Shoes to Athletic shoes to Boat/Deck shoes to Dress Shoes. Exclusions apply. See site for details. Get 20% off Women’s shoes. Exclusions Apply. See site for detalis. Get Up To 50% Off Men’s and Women’s Athletic Shoes. Some restrictions and exclusions apply. See site for details. Get 20% off sitewide sale. Some exclusions apply. See merchant site for details. Take an Additional 10% off Casual Shoes & Dresses everyday low prices. No code needed. Get 20% off Mens, Womens & Kids Winter Boots and Casual Shoes. Work Boots and Shoes are only 15% off. Exclusions Apply. See site for details. Restrictions Apply. Get $5 Off when you spend $100 or more. Restrictions apply. Get an additional 10% off everyday low prices on Winter Boots and Women’s Dress Boots + $5 off orders over $100. Some restrictions apply. 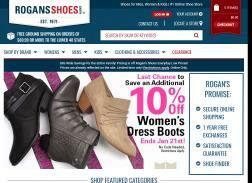 Get an extra 10% off Rogan’s Shoes everyday low prices. Black Friday Deals! Get an extra15% Off Kids Shoes. Restrictions apply. Sale held over! Get 30% off Clothing & Accessories for the family. Some exclusions may apply. Visit site for further details. Black Friday Deals! Get an extra 10% Off Sitewide. Restrictions apply. Get $5 Off orders over $100. Online Only. Save 20% off hiking shoes for mens and womens. Get 15% off sitewide plus 25% off Winter boots & Women’s dress boots. Work boots & shoes are only 15% off. Some exclusions apply. Visit site for further details. Get up to 50% off running and walking shoes. Some exclusions apply. See merchant site for details.